The Keno Cartomizer line comes three in a box and offers a soft tip design to provide a more realistic smoking experience. They come in a variety of flavors to suite everyone's taste buds. 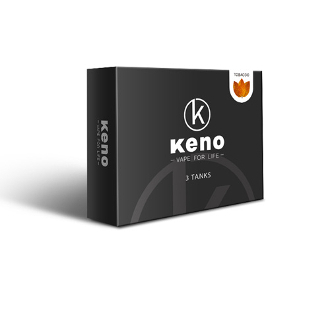 The Keno Cartomizers come in Menthol, Regular Tobacco, Cherry, and Vanilla. All flavors are available in 11mg and 16mg of nicotine to provide the user with a subtle throat hit at 11mg or a deeper and harsher hit at 16mg.